A garage door is the largest and most essential moving part of your residential establishment. It is meant to keep your home, family and valuables safe and secure. In return, all it takes is regular care and maintenance. Yes, if you want to see your garage door performing for years to come, you need to pay heed to its repair and maintenance. A well-maintained door tends to deliver excellent service reliably for years. On the contrary, a worn out and damaged door will only break the bank. Thus, it is vital for every homeowner to take good care of their garage doors. A Thorough Inspection – Yes, it is the foremost thing. You will not be able to determine the issue with the door, unless you check it carefully. That’s why, it is must to visually inspect your door once a week. In case, you find any damaged or worn out part, call a professional for immediate replacement. It is good to prevent the issue at its initial stage instead of waiting until the last minute. Test the Garage Door Balance – Your garage door should be well-balanced, otherwise the opener needs to work double its power to lift or drop the door. In order to check whether it is balanced or not, you need to disconnect the opener by pulling the release handle and move the door halfway up. It should stay like that and if it doesn’t, then you should call a professional for help. Lubricate the Moving Parts – All the moving parts of the door should be greased with high quality lubricant. This will enhance the life expectancy of the parts and make them perform smoothly. The entire process would just take around 10 to 15 minutes. Remember, you don’t have to lubricate all the parts, just the rollers, opener’s chain or screw etc. Check Cables & Springs – Both cables and springs are the vital components of a garage door. Make sure you check them regularly for any damage. They work under a lot of pressure and should be replaced in a timely manner. These are critical parts, so it is advisable to call a professional for the repair, maintenance or replacement of these parts. 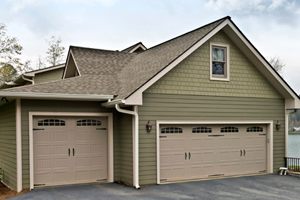 Remember, your garage door covers one-third of your home’s exteriors. So, it makes sense to take good care of it. You definitely don’t want your home to look shabby and outdated. In case, you are looking for professional guidance, feel free to contact our expert technicians Airdrie Garage Doors.